India Stonemart is the country’s leading exhibition on stone industry which showcases the world of natural stones and ancillary products and services. It has strategic and competitive importance for anyone related with the stone industry, in India and internationally. Exhibitors include stone quarry owners, stone processors, manufacturers and suppliers of stone-related machineries, stone craftsmen as well as architects and builders. 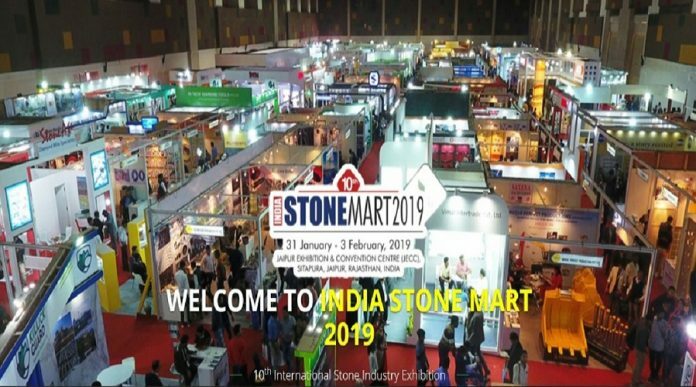 The India Stonemart presents itself for the tenth anniversary edition on 4 days from 31.01.2019 to Sunday 03.02.2019 in Jaipur. It is an all encompassing expositional umbrella which brings together everyone, across the seven seas, connected with stone industry together under its ambit. The exhibition is organized by CDOS with FICCI as co-organiser, supported by the Indian Government and sponsored by the biggest names in the sector from India and other countries as well. More than 25,000 visitors are expected in the trade fair this year while international participations come from 7 countries, such as Turkey, China, Italy, Brazil, Iran, Spain and Taiwan. Over 484 exhibitors from across the globe (350 Indian and 134 overseas) will be putting up their stalls at the mart this year. Like its previous editions, a two-day architecture festival will be held for generating new ideas. CDOS is also setting up a ‘Shilpgram’ at the event which will host stone artisans to showcase and demonstrate their art. 31 stone artisans from all over India are expected to showcase their skills and products.